The all-woman Ruth Beals Cup Regatta will return to Lake Pleasant on Saturday, October 27, with the starting gun at 9:30 am. It’s for women at the helm in run-what-you-brung boats rated by PHRF handicap. Race documents here. Registration is closed. 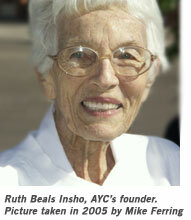 The race is named for the founder of AYC, Ruth Beals, and offers a chance for the women of the club to compete against other women. Men are allowed to crew, but not to get too close to the tiller. There will be a single long-distance race, following the familiar course from a start/finish in the south portion of the lake, around Horse and Balance Rock and No-Name island (also called Bobcat), back to a finish line in mid-lake. It’s more or less the same course we’ve used for the Governor’s Cup and the Tall Cactus Regatta. After the racing, there will be a gathering at Scorpion Bay’s restaurant deck with AYC-offered nibbles and cash bar. Ellen Wesley is the defending champion, teaming up with Victor Felice in a J/24 to win in light air one year ago. 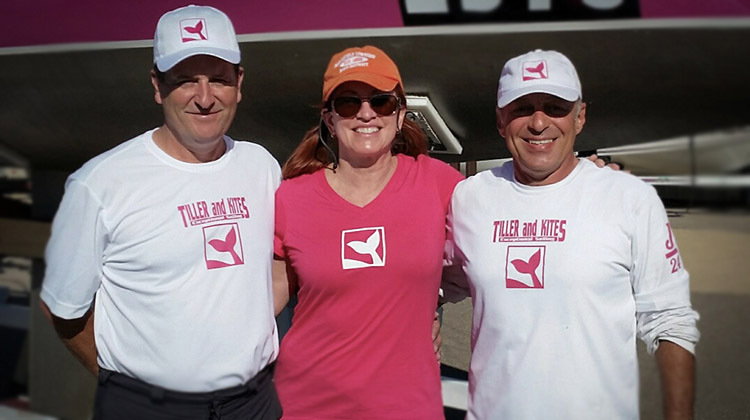 Maryellen Ferring finished second in her J/80 and Ryane Griffis was third in an Etchells. This year, Victor has entered five (yup, five) boats that will include crew from the Foundation for Blind Children. Ellen Wesley won the Ruth Beals Cup despite the two characters flanking her.